I have been using a very distinctive smelling beard balm, The Beardy Beard Company ‘3 Kings’ Beard Balm, the balm clearly gets its name from the fact that it’s scented with the ancient oils of Frankincense & Myrrh and is finished off with Cinnamon leaf. There is certainly no forgetting that you have ‘3 Kings’ Beard Balm on your beard, the woody warm scent with a real spicy kick not only smells good, you can also feel it on your beard if that makes sense, I don’t mean you feel the balm, you feel that spicy warmness and it gives your beard that feel fresh and alive sensation. I hadn’t used a product with Frankincense in until recently when I tested a Beard oil that used it and now this balm and its a great scent, its a warm and sweet smelling oil that works on the part of the brain that deals with emotions and isn’t considered enough in beard care, Myrrh also has a positive effect on our emotions and has a rich and Smoky and also has a balsamic like aroma, Myrrh also helps prevent chapped, and cracked skin and so if you work or play outside in harsh conditions, this balm will prevent chapped lips. 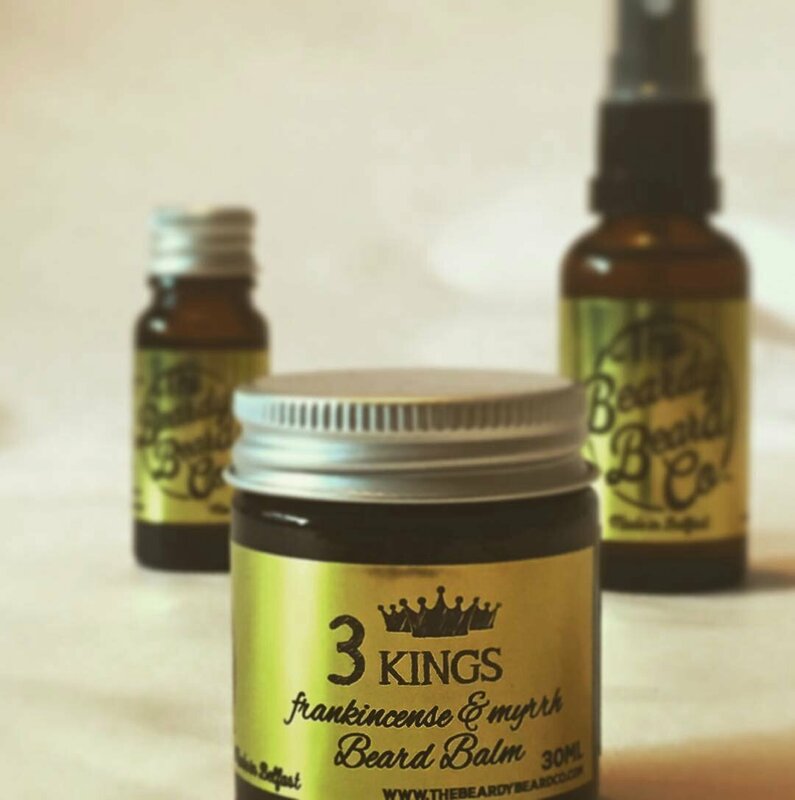 The Beardy Beard Company ‘3 Kings’ Beard Balm is a firm but not solid balm that gives a nice hold to your beard, this means that your beard will keep on looking awesome for longer. It also does a good job at softening my dry beard and gives it a nice healthy looking sheen. ‘3 Kings’ comes in a 30ml glass jar with a screw on metal lid, the gold label suits the balm perfectly and finishes the ‘3 Kings’ branding of this product completing the trio of Gold, Frankincense and Myrrh. ‘3 Kings’ is available from The Beardy Beard Co website for £10.95 and you can also keep up to date with all things to do with The Beardy Beard Co on Twitter and Facebook.